Interactions in virtual spaces have been a difficult not to crack for some time, as while a keyboard and mouse are a highly-used pair of peripherals for using a computer, they become less useful when the user cannot see them while wearing a headset. 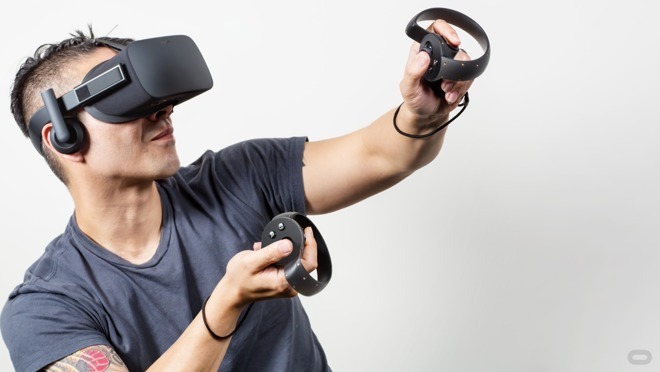 Current VR systems do offer an alternative interaction tool, in the form of motion controllers, but while a user can "grab" a virtual item, the fact that they are already gripping a controller means the effect is lost. 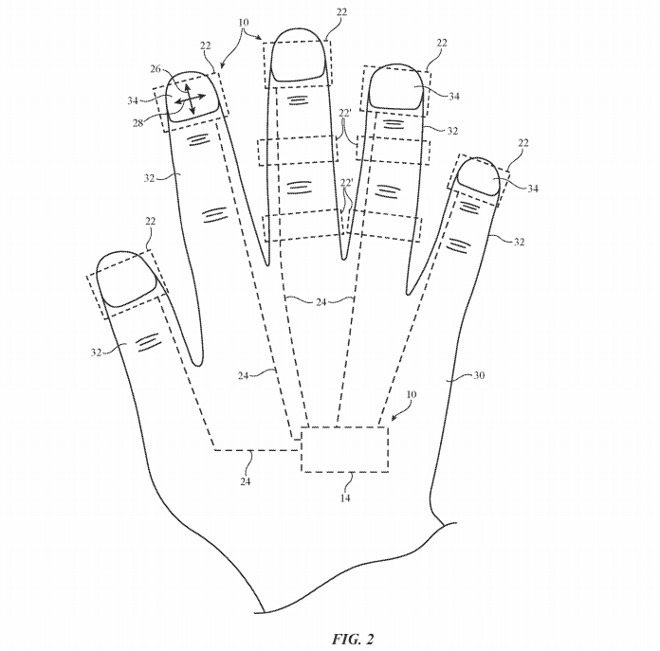 In a patent application filing published on Thursday, Apple suggests the use of a "finger-mounted device with sensors and haptics" as an interaction tool. The proposed system uses a series of sensors that attach to the back of the user's hand, and at strategic points along their fingers, in order to mount sensors to detect movement and to provide a form of haptic feedback. Rings can be placed around the user's fingertips, anchored by the fingernails, which can be used to determine if a single or multiple finger is used to interact with an item or to perform gestures, and to offer simple haptic feedback in some instances, such as to feign contacting an item or to confirm input on a virtual button or keyboard. Onboard sensors could include force sensors and accelerometers, among others. These feed back to a control unit on the back of the hand itself, which in turn is connected to the computer system. Though the patent application does not directly mention if the finger units are a distinctly separate device to the main control unit, it is plausible that the finger sections could be separate and wirelessly communicate with other parts of the system, or could be connected together by a deformable material. There is also the possibility of using finger sleeves that leave the underside of the finger pad uncovered, allowing the user to feel other real-world items normally while still being able to interact with the virtual version. 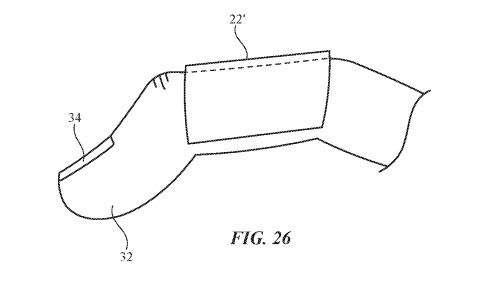 While there have been attempts to do the same thing a href="http://www.sensoryx.com/finger-tracking/">with gloves, Apple's solution seemingly does away with the need to wear the entire garment for the system to work, while also keeping the real sensation of touching physical items available to the user. The sleeves could simply clamp onto the finger using spring tension, allowing it to stay attached to the finger without immediately slipping off during movement. It also does not have to be placed on the tip of the finger, as it could also be positioned between the knuckles in the middle of the finger. While the primary usage for the concept is for VR and AR work, it may also be usable in non-virtual ways, including one reminiscent of the movie Minority Report. Cameras could track the location of the hand by detecting a visible marker or sensor on the device, while onboard sensors could help refine the data by advising more data on the position of the hand and individual fingers, allowing the hand to interact with a projected scene or interface. Apple does file numerous patents and applications with the United States Patent and Trademark Office on a regular bases, but while the publication of a filing may indicate where the company is thinking on certain topics, it isn't a guarantee that Apple will be bringing the described concepts to market anytime soon. The company has explored the area of VR and AR, with its most visible results being in the latter category, and has filed a number of patent applications relating to both fields, including eye tracking and 360-degree multi-camera video refinements. While it has yet to produce its own VR or AR headset, filings have suggested it has considered a few designs and technologies, and though it is seemingly in a great position to create its own hardware for the market, there doesn't seem to be a sign any sort of Apple-designed headset will be available soon. Developing that rumored set of Apple Glasses we've read about? This patent is really similar to one Google filed for their Project Glass a few years back. Personally I fully expect to see an Apple AR/VR wearable sooner rather than later. Apple employees are as good as other high tech companies. What Apple misses now is a person like Jobs that can integrate all the new technologies into one product useful to all people. Apple is cooking up something we've never imagined. But of course everyone will claim "but but Apple never invented anything!" I'm wondering how it will compare to all the gloves already out there. I'm sure people will be stepping on everybody else's patents?